Everyone's expecting to me to name Rudy's Taste. Rudy's Taste is a heck of a nice place, y'all should come to my dinner. But Rudy's Taste didn't change my life. Katsu changed my life. This community changed my life by leading me there. What more could you ask of a little place on an obscure stretch of Peterson? Is that not Great Neighborhood Restaurantness in a nutshell? Last edited by Mike G on May 2nd, 2007, 7:50 am, edited 1 time in total. Mike G wrote: What more could you ask of a little place on an obscure stretch of Peterson? 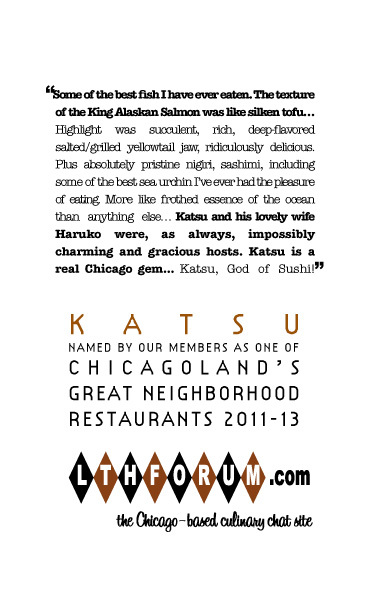 Katsu is a terrific restaurant and I enthusiastically second Katsu's nomination as an LTHForum.com Great neighborhood restaurant. I agree as well, with Katsu having the added bonus of actually being a neighborhood restaurant for me. Viva Katsu! It's our top choice for when we really, really want to treat ourselves. Every meal I've eaten there was brimming with surprises, smiles and supreme freshness. We can walk there on a good night, so we can sake ourselves silly if we want to. Katsu is superb. Heartily fifthed. Or whatever number we're up to. Katsu and his wife Haruko are always happy and welcoming. When I have dinner there, I become uncharacteristically quiet... It is that good. Which might explain why the boy is always willing to bring me there. I just had a phenomenal meal at Katsu about 2 weeks ago and I whole-heartedly support its renewal. I have pretty much sworn off most sushi in Chicago. I've eaten at so many places that turn out predictable rolls and fish that, while fresh "enough" are far from excellent, and while Katsu's style of thicker cuts is not my preference, there's no arguing with the quality of the finny tribe served here...and ronnie's lavishly documented recent trip filled me with awe and a desire to return. GNR-worthy...and like many of our traditional GNRs, slighlty off-radar for the public-at-large, and, so, more ours. True in 2004, still true, if not more so, in 2009. Full support for Katsu's GNR renewal. I eat at Katsu a couple of times a year, if I'm lucky. I'm always surprised and impressed by at least one thing or another that I eat, and have not been disappointed in anything. It remains for me the standard by which all other Japanese restaurants in Chicago are judged. I support renewal. I second this nomination. Katsu is the standard by which I judge all Chicago sushi restaurants by. And unlike some other places (wink), it is always consistently great. Katsu is by far, the best sushi I have ever had. I was fortunate to sit a the bar and watch Katsu at work. He truly loves what he is doing and his passion is shown in his food. An absolute renewal in my opinion.